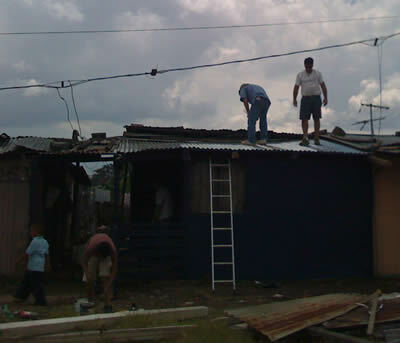 This morning, the fellas re-roofed the shanti of a family down in Juan Pablo. Though the mother was at work, her two boys helped paint and worked the entire morning with the rest of the team. Lalo, who was a bit of a hellian has really started to come around. It appears that all he needed was some attention and some love… Who would have thought? After lunch, we headed up to Jasmine which is a small shanti town just two miles outside of the city. 6:8 is partnering with a local church to build “Little Yellow Houses” for the people there as they are so poor. Unfortunately, we didn’t make it all the way to Jasmine as the rainy season is now officially upon us… Instead, we made it about half way, got soaked to the bone, and then found that the dirty roads in Jasmine were all flooded (as the town is on the mountainside, we wouldn’t make it up). Either way, the team will attempt to go again tomorrow morning.